Wheels That Won The West® Articles - Chuck Wagon Wheels…Too Big, Too Small or Just Right? "without solid roots in period documentation, we have no reliable standards for authenticity beyond the prejudice of individual opinions and personal preference." Originality and Authenticity... they’re the ultimate vehicle standards that every chuck wagon enthusiast strives for. While these standards are generally easy to agree on in principle, the details that define each can generate a lot more discussion. As a western vehicle historian and avid collector, I have the opportunity to field hundreds of wagon-related questions each year and, recently, was challenged with one concerning trail wagons. Specifically, did the majority of 19th century trail chuck wagons have wide or narrow tires and what evidence is there to support either proposition? A follow-up question pondered whether high, narrow wheels had the strength and other characteristics necessary for the rigors of trail work. Like many, I suppose, I had my own set of assumptions, but when pressed for proofs, I came to realize I had minimal objective evidence to back up my thoughts. That was all the push I needed to dig into our Wheels That Won The West® archives to see what original, primary source evidence could be found. After all, without solid roots in period documentation, we have no reliable standards for authenticity beyond the prejudice of individual opinions and personal preference. What follows is an itemized overview of many of the findings from this study. A. Standard Tire Sizes... With access to one of - if not - the largest and most diverse collection of early American wagon literature and brand-specific period photography, I began my search. 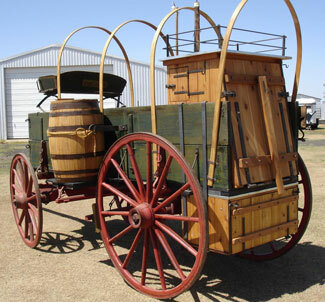 In reviewing original wagon catalogs from the 1870's, '80's, and '90's, it became increasingly apparent that most Texas, Kansas, Oklahoma Territory and Indian Territory farm wagons as well as Mountain wagons were sold standard with tire widths primarily in 1/8" or 1/4" increments starting as narrow as 1 1/8" and progressing all the way up to 2". In all of the early literature reviewed, the overwhelming majority of standard tire width offerings were less than 2" in width. The only evidence of wider tires as standard equipment appeared on California rack bed wagons, log wagons and other similarly specializedvehicles. These results were gleaned from the 19th century literature of Newton, Studebaker, Peter Schuttler, Mitchell, Jackson, Ionia, Tennessee, Kentucky, Bain, Birdsell, Weber, Fish Bros.(Racine) and numerous other legendary wagon firms. With more than 38,000 wagon makers and repairers still in business at the turn of the 20th century, these builders are far from the majority - but they do represent a notable portion of the major players marketing wagons west of the Mississippi in the 1870's through the 1890's. Consequently, these materials can give us a good snapshot of what was commonly accepted as the general standards of the day. Of course, virtually all makers allowed for exceptions and wider tires were generally available as an extra cost option. However, the fact that numerous narrow tire sizes (below 2" in width) were offered as standard choices - with detailed specifications shown - while wider tires were typically relegated to only brief mentions -without associated specs - calls into question the overall market demand for wide tires versus narrow in the mid and western U.S. states/territories during this time period. As such, it becomes reasonably apparent that the predominance of the farm-style wagons used in these areas and during this period did utilize narrow tires. B. Wheel Strength... As part of the tire width question, I was asked whether high wheels with narrow tires were truly of sufficient strength for cross-country travel. Again, extensive review of period catalogs and countless photographs of western emigrants cast doubt on the validity of this concern. In fact, in both wooden axles with cast thimble skeins and iron axle wagons built during the last three decades of the 19th century, the smaller width tires are not advertised with small weight capacities. For instance, high wheel wagons with tire widths of just 1 ½" were commonly promoted among the major builders with capacities of 4,000 pounds. Put in perspective, that's more than the touted payload of a modern day, full-size pickup truck. Wagons with 1 5/8" tire widths were regularly advertised with 5,000 pound capacities. Newton even promoted its 1 ¾" tire width wagons (includes Texas, OK, KS, etc.) with a 6,000 pound capacity. Just as interesting, Bain, Schuttler, Fish Bros., and Studebaker catalogued actual “freight wagons” with tire widths as small as 1 ¾" and corresponding carrying capacities of 5,000 pounds. While chuck wagons certainly carried a type of ‘freight’, they would not need multiple ton capacities of this caliber. Clearly, high wheel, narrow-tired wagons were not considered weak or frail by our 19th century counterparts. In fact, just the opposite can be stated as evidenced by the touted payload capacities within the period literature. When discussing the strengths of 19th century high wheel wagons, it should also be noted that the 50" and 52" rear wheel heights of what many refer to as high wheel wagons today had counterparts in the 1870's and '80's with even taller wheels. 54", 55", 56" and larger wheel heights were regularly shown as standard features on the narrow (less than 2") tires of early wagons. Certainly, as manufacturers approached the 20th century, the higher clearances were not as necessary and standardization between manufacturers was more consistent. C. Loose tires... Did narrow-tired chuck wagons have problems with tires working loose easier than wider tires? Good question. It should be noted that vintage chuck wagons have been regularly documented with tire rivets installed between the felloes and tire to prevent this from being an issue. Loose tires, like flats on modern automobiles, were not uncommon issues of the day and would have been planned for by most responsible long distance travelers. D. Period photography... While period trail wagon images are tougher to come by, there are significant numbers of 19th century ranch chuck wagon photos with narrow tires. Equally - if not even more - supportive, there are large numbers of western emigrant images clearly sporting tires less than two inches in width. Beyond familiarity with the look of tires in this size range, researchers can determine actual measurements of tire widths in the photos bycomparing the tires to other known and generally accepted measurements on the wagon...i.e. the edges of the sideboards, tire rivets, wheel nuts and other hardware/accessories. Our research uncovered dozens of books documenting the American West which consistently showcase early examples of high-wheeled, narrow-tired wagons navigating the plains and western expanses of America. E. Arabia Discovery... Published in the January 2008 issue of the Carriage Journal magazine is a feature story I wrote and originally posted on our “Wheels” website in the early summer of 2007. 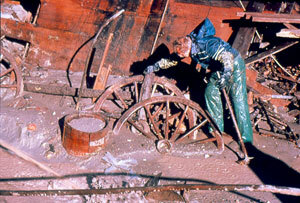 The story profiles a wagon gear uncovered in 1988 from a steamboat headed west in 1856. Before it reached its destination, it sank in the Missouri River near Kansas City. I was fortunate to obtain permission from the Arabia Steamboat museum to get a first hand analysis of this gear and spent several days securing detailed photos, measurements and observations. It's an amazing piece that is likely the earliest surviving factory-built western wagon in America. It also has a number of other notable features, including what I’ve documented as the earliest known use of cast skeins and hex head hardware. The feature-length article comes to the conclusion that all available data points to this being a Peter Schuttler creation. The narrow-tired wheels are 1 ¾" wide with 44" front wheels and 54" tall rear wheels. Distance between bolster standards is 38" and the wheel track is 56" - all consistent with typical western wagon dimensions showing up in later 19th century catalogs of virtually all major wagon makers. F. 19th Century Research... Coincidentally, this same question regarding the use of wide tires versus narrow tires shows up in 19th century discussions as well. Authored by John J. Thomas and published in 1855 by Harper and Brothers of New York, the book, "Farm Implements and the Principles of their Construction and Use", outlines numerous mechanical and mathematical principles used in common implements and tools of the day. On pages 109-110, the author examines the virtues of both narrow and wide wagon tires. His research concludes that wide tires do well on "broken-stone roads and gravelly or dry sandy localities." He continues by noting that narrow wheels run equally well on solid surfaces and much better on wet, muddy and clay ground since there is less surface area for the soil to "load the wheels." Clearly, chuck wagons and emigrant wagons did not have the luxury of a nice gravel road or the ability to avoid rainy weather and wet terrain. Equally notable, with millions of cattle driven over the trails between 1866 and 1885, the herds would have needed significant quantities of grass to survive the long trail drives, making a cross country drive across a continual sea of dry sand implausible. With such solid performance in a broad range of terrain attributed to high, narrow wheels, it becomes easier to understand their promotion in vintage literature and overall acceptance from the plains to the mountains. As an interesting side note... Captain Randolph Marcy's guidebook, "The Prairie Traveler", was published just prior to the Civil War for emigrants preparing to cross the western expanses of America. In it, he covers a number of important wagon-related issues and how to both prepare for and address them. Nowhere in the lengthy list of wagon topics is the subject of tire width covered. Why? It's doubtful that the subject was overlooked if considered an important question to travelers. So, we're left to conclude that either this was an obvious choice of the day - in which case it would reinforce the apparent popularity of narrow-tired, high wheel wagons shown in the early literature - or perhaps neither wide nor narrow was of that much importance. Considering the primary source information already mentioned, the evidence seems much stronger for a common acceptance of high wheels and narrow tires. Due to the availability alone of wide tires on 19th century high wheel wagons, it is quite likely that some vintage trail chuck wagons may have employed wider tires - especially in the 2" categories. However, in spite of extensive research, no primary source evidence has surfaced that would lend credence to a supposition that a majority of trail chuck wagons had wider tires (those over 2" in width). On the contrary, from photographs of 19th century ranch chuck wagons and emigrant wagons to the original 19th century promotional literature of major wagon makers as well as the writings of farm equipment specialists and trail guides, there appears to be much more evidence to support a stronger use of high wheels with narrow tires (those less than 2" in width). Ultimately, the tire width/height question is an excellent one for the sole reason that it reminds us of the need to closely examine the source of our authenticity standards. Collecting and documenting original, primary source data continues to be the best resource we have to help ensure accuracy and we do a huge service to future generations by sharing our findings. 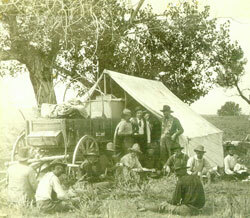 As such, horse drawn vehicle groups like the Carriage Association, the American Chuck Wagon Association and the newly-formed National Stagecoach and Freight Wagon Association are to be commended for their ongoing efforts to bolster education while highlighting the legendary features and accomplishments of 19th century transportation.